What sets Fisher Honda apart from other Colorado Honda Dealers? Fisher Honda has been family-owned and -operated since 1968, and things are still run the same way they used to be. We strive to treat each of our customers as if they are part of our family, and we will do everything we can to ensure you have a great car-buying experience. Whether you are purchasing a new car, visiting our service department, are at our parts counter, or in our full-service body shop, we want to exceed your expectations of what doing business with a car dealership is like. Fisher has an outstanding reputation that speaks for itself, with over 1,000 Google reviews and a 4.8 out of 5 rating. To view our reviews on Google, click the image above. 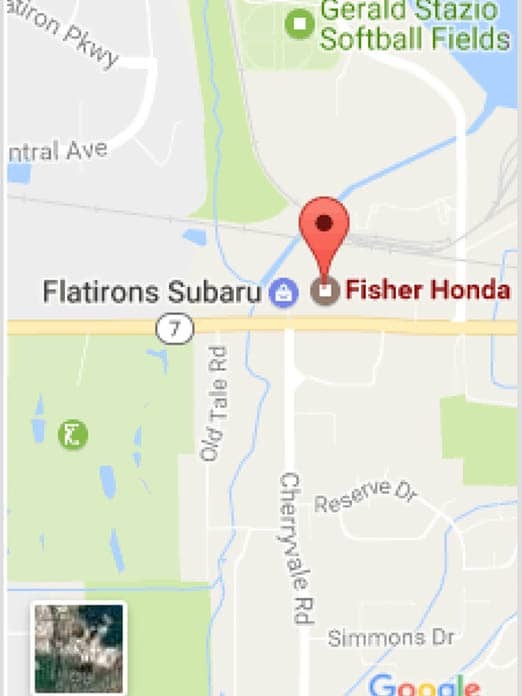 Fisher Honda provides all of your automotive needs at a singular location. We have a gorgeous new Honda showroom, a service center for all maintenance on your vehicles, a parts department that carries OEM parts, and a full-service body shop. If you make the decision to buy your vehicle at Fisher, your first oil change at Fisher is on us. All of the vehicles we sell come with nitrogen-filled tires, which will improve pressure regulation and increase the life of your tires. Any time you need to add nitrogen to your tires, just stop on by and it is free of charge to Fisher customers. After you purchase your new Honda, we offer new owners’ clinics that will get your familiar with the staff and facility here at Fisher Honda. You will become more familiar with the staff in each of our departments. To learn more about the Honda new owner clinic, click here. Price match guarantee is only available on the 2016-2017 Honda Fit, 2016-2017 Honda HR-V, 2016 Honda CR-V, 2016-2017 Honda Accord Coupe, 2016-2017 Honda Accord sedan (except Touring trim), 2016-2017 Honda Civic sedan (except Touring trim), 2016-2017 Honda Civic Coupe, and the 2016 Honda Odyssey. All price matches require a legitimate write-up or offer to purchase from another dealer. Subject to dealer discretion and may not be honored in all cases.